I completed a Bachelor Degree in Prosthetics and Orthotics at La Trobe University. Why did you choose to study prosthetics and how long have you been working as one? I wasn’t sure what I wanted to do when I finished school but, when investigating future careers during Year 12, my Careers Advisor identified prosthetics as a potential pathway for me. I then visited La Trobe University and decided that I might be suited to the profession. As it turned out I did love this profession from the outset. I undertook my final practical placement with APC Prosthetics in New South Wales and was offered employment there upon my completion. I’ve now been working for APC Prosthetics for 16 years. Describe the clients you work with? I work with people with upper and lower limb deficiencies, ranging in age from 6 months old to well into their 90s. While I enjoy working with all of my clients, supporting children is very rewarding because of their attitude and ability to try anything! What role does a Prosthetist play in supporting children with limb differences? Prosthetists play a really important role in trying to match what the child needs and wants with a prosthetic socket and components that best enables them to engage in all the fantastic activities kids do. When a child wants to do something and can’t because of their limb difference I see the Prosthetist’s role as finding a solution that can allow them to achieve their goals. What is the step-by-step process involved in fitting a child with a prosthesis? The first appointment is usually to take a cast, followed by a first fitting and any follow up adjustments that need to be made. Over the life of the prosthesis it often needs adjustments such as lengthening as the child grows. Once these adjustments are no longer possible then a replacement socket or entire new limb is made depending on the condition of the components of the prosthesis. As children are very active and adventurous, their componentry never lasts very long as they are always outgrowing them or breaking them! What role do you play in supporting the families of children with limb differences? I’m there to answer the many questions parents and family members have. Information is critical as are providing chances for children and families to connect. The new Limbs 4 Kids program and publications are great as it provides a great mix of information, individual stories and chances to connect. What multi-disciplinary healthcare professionals do you work with to support to children with limb differences? I work with an array of experts that generally include a Paediatric Rehabilitation Consultant, Physiotherapist, Occupational Therapist and others as required. Why is early-intervention support important for children with limb differences? The earlier a child uses a prosthesis the more likely they are to accept it and use it throughout their life. In congenital limb differences cases, regardless of whether it is upper or lower, early-intervention can be really important to help the child meet their milestones and keep their spine symmetrical; which enhances their lifetime physical wellbeing. What information do you give to all children with limb difference and their families? I recommend that they keep seeing the rehabilitation team because even if the prosthetic side of things are sorted, there are often other areas of a child’s health that the clinic can assist with. What current developments in the field of prosthetics excite you? I’m excited by three key things – the NDIS, running prosthetic advances and myoelectric hand advances. As the NDIS is rolled out, the funding should provide children with more appropriate prosthetic technology. As the NDIS will cover all people under the age of 65 we should see funding for secondary recreational or waterproof limb being available. As we are based in NSW, where the NDIS is being trialled in Newcastle, my organisation is already seeing some fantastic outcomes for amputees and people with limb differences in that region. Carbon fibre feet and running blades have come a long way in the last 10 years and, even more excitingly, they have become more accessible to everyone wanting to run and not just athletes. This is particularly important for children because it gives more opportunity for children with limb differences to keep up with (and sometimes beat!) their mates at school. There has been considerable research and improvement in myoelectric hands in recent years, and I am really excited about the significant opportunities this will present for children and adults with hand limb differences in the future. What is the Bandaged Bear Appeal? 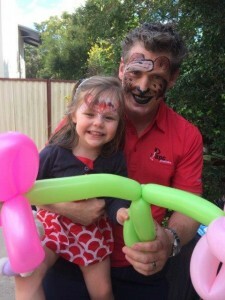 Five years ago APC Prosthetics decided to hold an annual Bandage Bear Breakfast fundraiser which raises funds for the limb deficiency clinic at the Children’s Hospital at Westmead (Sydney). It is a fun morning where we try and have as many of our kids come as possible. We try and have a Bandage Bear Ambassador and this year had the bandage bear himself! APC Prosthetics provides the catering, face painting and venue. Each year we raise close to $10,000 and are always looking for more people to attend and donate. Our 6th Bandage Bear Breakfast will be held in March 2016 and we hope some of the Limbs 4 Kids community can join us. Any other tips for families? Yes, one of the things families should look out for is the AMP Camp, which is held in NSW in March of each year. It is a camp that the Amputee Association of NSW help to support and allows children with limb differences between the ages of 12 – 18 to meet one another and participate in a range of activities. One of our older above-knee clients organises the event and I volunteer as a leader each year. It’s a fun social event and many of the teenagers return each year to catch-up, participate and some have gone on to become leaders themselves.